This is the brass gear that is pressed onto the crankshaft. It engages into the distributor drive pinion gear, which spins the distributor. 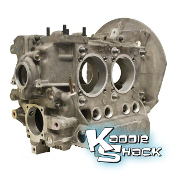 It is easily damaged, as it is made of brass, so inspect it carefully when rebuilding your engine and order a new one if necessary. Crankshaft Gear Spacer, All Upright and T3 Engines '61 & Later Crankshaft Gear Performance "Racer Spacer"
This is the spacer that is installed between the two gears on the crankshaft. 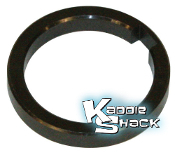 This "racer spacer" replaces the stock crankshaft spacer when building a performance engine. It does not have an opening, so it stronger for high performance engines and less likely to fail. Many performance engine builders swear it's "cheap insurance". 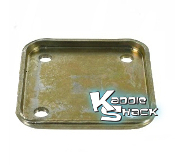 This is the oil slinger, also known as the deflector plate, that installs under the crankshaft pulley. It's job is to deflect the oil that is expelled by the main bearing, and direct it back into the case. If missing, your engine will leak oil... This is the snap ring retainer that holds the gears and spacer in place on the crankshaft. It is common for them to fatigue and seperate when removed during a rebuild. 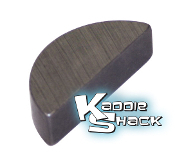 We recommend using a new one every time, and make sure it is seated properly in the groove. This is the large gear that is pressed onto the crankshaft that engages into the gear on the camshaft. This is the large woodruff key that is pressed into the crankshaft. It holds both gears on the crankshaft in place. This is the small woodruff key that is pressed into the crankshaft. It holds the pulley on the end in place. Install it before you mate the case, as it's not fun to try and do it later. Make sure the oil slinger is in place before you install it. This is the spring underneath the distributor that slips into the distriutor drive pinion gear and applies pressure to the bottom of the distributor. Don't forget to install this spring or the timing may act erratically. This is the pinion gear that is driven from the brass gear on the crankshaft. It slips into the top of the case and drives the distributor. 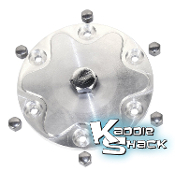 Use the shims (washers) underneath it to properly set the end play. 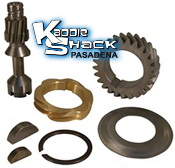 This kit consists of all 7 components needed to install the gears, woodruff keys, and oil slinger on your crankshaft as the bearings are being installed. It even comes with the distributor drive gear for the case. it does not come with the shims... 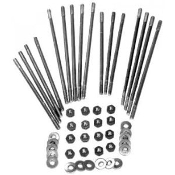 This engine case hardware kit comes with the necessary nuts, bolts, and washers to assemble your VW Type 1 engine case, install the exhaust, and install the oil drain plate. Comes in 2 sizes: One for cases with 8mm cylinder head studs, and one for cases with 8mm head studs. 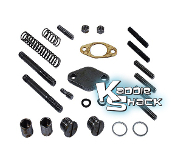 This engine case hardware kit comes with the necessary nuts, bolts, and washers to assemble your VW Type 1 engine case, install the exhaust, and install the oil drain plate. Comes in 2 sizes: One for cases with 8mm cylinder head studs, and one for cases with 8mm head studs. Engine case dowel pins hold the main bearings in place in the case. 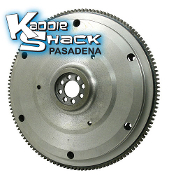 A perfect stock replacement for your rusty, warped, and heat-damaged flywheel. Don't forget the o-ring! Use on stock 12V (200mm) engines. This is the stud that holds the engine oil drain plate to the bottom of the engine case. It requires the special sealing nut to keep the drain plate secure. This is the stud that holds the engine oil drain plate to the bottom of the engine case. Complete set of 6 studs. This is the acorn nut that secures the drain plate to the engine case. Sold each. 6 are required. This is the acorn nut that secures the drain plate to the engine case. Set of 6. 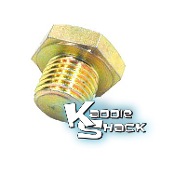 Stock engine oil drain plug fits all upright and Type 3 engines 1961 and later. Performance engine builders agree: A quality gland nut is a MUST for any performance engine build. These are the stock size, and can take over 500 ft-lbs of torque to keep your 8-dowel or 4-dowel flywheel in place. A perfect stock replacement for your new build, or replacement. Chromoly case studs provide superior holding strength. Hardened washers and nuts are included. The camshaft plug installs between the case halves when mating the engine case together. It is our recommendation to ALWAYS use a new cam plug. They're not expensive, and if it leaks, you'll have to split the case to replace it. Not fun! 12-point, 8mm threads. Fits 10mm 12 point socket when extra clearance is needed. Super hard. 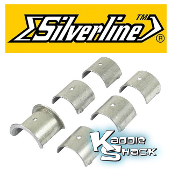 We especially like them for exhaust studs, as they can be torqued very hard to prevent exhaust studs working loose. 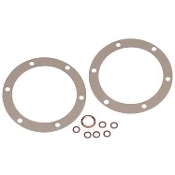 Pack of 8 Set of 4 cylinder shims for setting deck height by shimming the cylinders away from the case. These fit the stock (non-cut) cases and cylinder sizes. Available in .010", .020", .030", .040", .060" and .090" increments. Can be stacked to achieve perfect deck. Set of 4 cylinder shims for setting deck height by shimming the cylinders away from the case. 94mm and 92/90.5mm are pre-clearanced for 8mm or 10mm studs. Available in .010", .020", .030", .040", .060" and .090" increments. Can be stacked to achieve perfect deck. Set of 4 cylinder shims for setting deck height by shimming the cylinders away from the case. 94mm and 92/90.5mm are pre-clearanced for 8mm or 10mm studs. Available in .010", .020", .030", .040", .060" and .090" increments. Can be stacked to achieve perfect deck. These really hold the exhaust in place. Use a 12mm wrench to tighten nut. Helps get into tight spaces. Locking style. One time use. Recommend replacing if removed. These nuts are the choice for superior strength, and for getting into hard to reach places. Worth every penny for that tough installation. 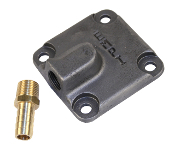 Brass nuts only have 11mm hex to get into tight spaces and are extra long for better grip. Aluminum Spring Loaded Push Rod Tube - Single 8mm x 31mm Stud, Commonly Used For Intake/Exhaust/Case, etc. Fix a leaky push rod tube with this quick and effective fix without removing your engine head(s). 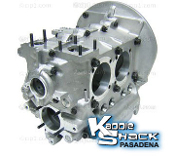 Need to replace a broken, rusted, or stripped stud on your engine case, cylinder head, trans, etc? 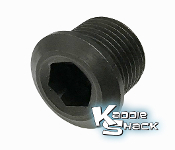 8mm x 40mm Stud, Commonly Used For Intake/Exhaust/Case, etc. 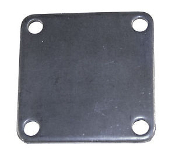 8mm x 46mm Stud, Commonly Used For Intake/Exhaust/Case, etc.